As I strolled through the Durham Farmers Market on a beautiful day in May 2013, I stopped and spoke to a chef who was gathering local produce, cheese, and herbs into large plastic crates. Glancing at his list as he moved from vendor to vendor, he wore a vintage brown and tan ball cap—the kind truckers wear—with the word Piedmont on it. His name was Ben. I told him how refreshing it was to see a chef shopping the farmers market. We didn’t see that often (or at all) in the small towns we had previously lived. 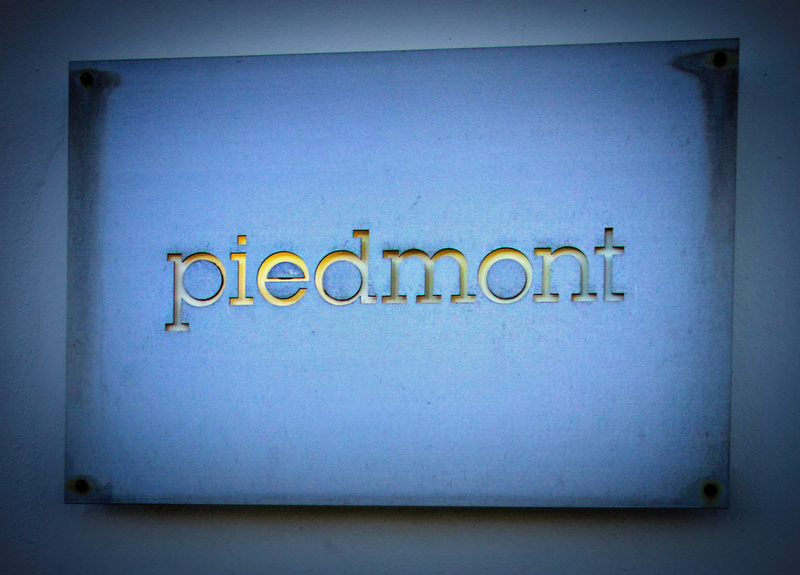 When I asked him where he worked, he motioned down the street and said we should visit Piedmont sometime. Fast forward to January 2015. 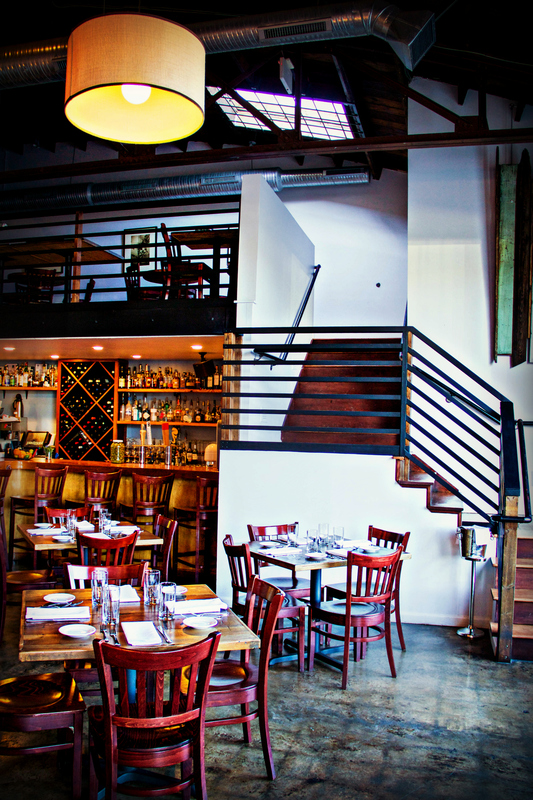 I am sitting across from Chef Ben Adams in that very restaurant, Piedmont. 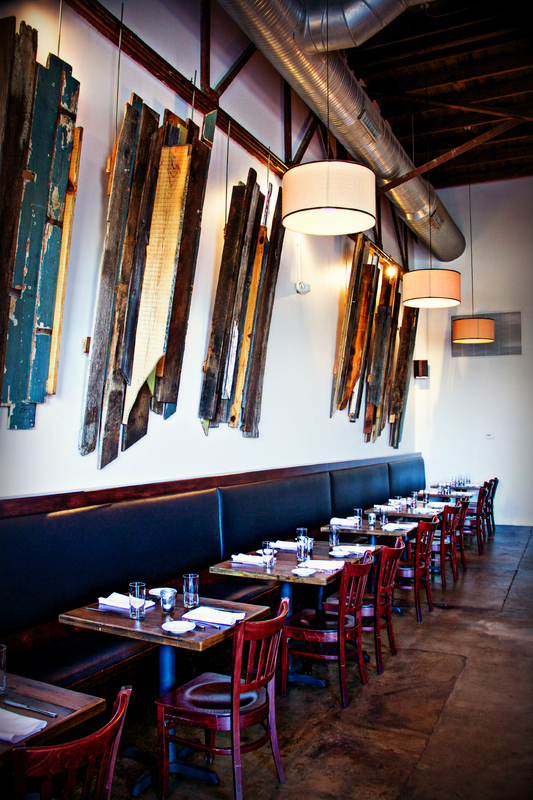 It is a warm, inviting space on Foster Street in downtown Durham with an elegant yet industrial vibe. It is owned by Jamie DeMent and Richard Holcomb who have a deep passion for local sustainable agriculture. Chef Adams sips tea while I tell him the story of our first meeting and how this interview feels like it was two years in the making. He smiles and says that he must have just started his job at Piedmont when we met at the market. 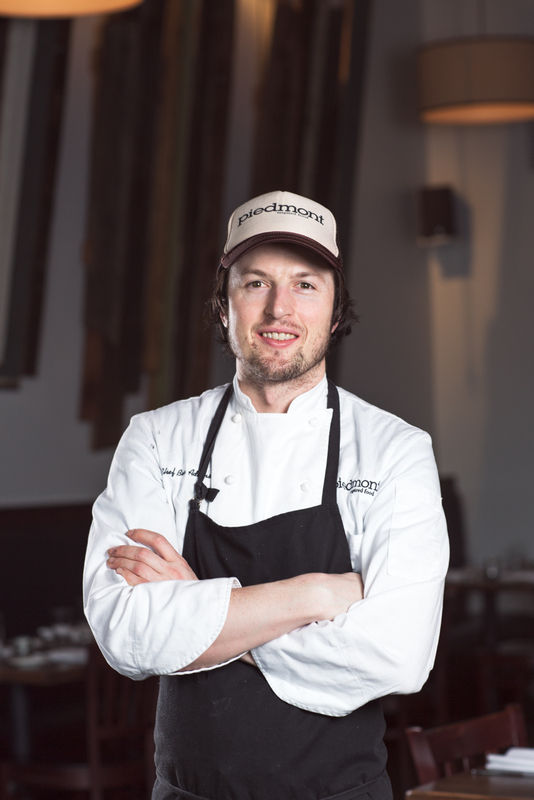 Chef Adams’ journey to Piedmont began with cooking school in Portland, Oregon after which he returned to his hometown of Charleston, South Carolina to work at Hominy Grill and later, McCrady’s. Chef Adams also spent time in Belgium, Australia, New Orleans, and Boston—each destination adding an element to his personal style, which focuses on seasonal produce with a refined twist. Local, seasonal produce, meats, and products were the theme woven through all of Chef Adams’ experiences. He saw his mentors, like Chef Sean Brock, operating with this focus and wanted to do the same wherever he went. Chef Adams explains that there is a balance between showing care—putting time and effort into the preparation and plating of each dish—and creating an element of home cooked comfort food. It’s a balance that he has perfected. He seeks to elevate the local produce through the method of preparation and the flavor pairings. Chef Adams is motivated by the challenge of creating new menus with the same ingredients in each season. In his second winter at Piedmont, he is pairing a sweet potato and bacon hash with pork. To compliment the pork, he added apple butter, toasted hazelnuts, and a juniper jus. Last year, a similar hash accompanied a beef preparation. Winter can be a difficult time to cook seasonally, so Chef Adams looks for inspired ways to prepare ingredients. He explains that last winter; he juiced sweet potatoes and made them in to a reduction, adding sorghum and sherry vinegar. Sweet potato sauce? Brilliant! This year, North Carolina’s beloved orange tuber debuts in a sweet potato and pear soup with bacon jam, hazelnuts, sage oil, and browned butter. This is refined comfort food at its best. Chef Adams believes there is a strong community of people who care about food here in the Triangle. He takes his responsibility to source and serve local produce, meat, and seafood very seriously. The chef-farmer relationship is vital to this mission. His dedication to cultivating these relationships has provided him with consistent supply and farmers who seek to grow what he wants. In his dishes, he also incorporates many products grown, raised, and made in North Carolina and beyond—Anson Mills, First Hand Foods, Joyce Farms, Chapel Hill Creamery, Rappahannock Oysters—just to name a few. On January 27th, Chef Ben Adams will compete in the Got to Be NC Competition Dining Series – Triangle. He is going up against Chef Chelsi Hogue from Ed’s Southern Food & Spirits in Goldsboro. It his is first time participating in this challenge. I asked him to explain his approach…without giving away any secrets. He leans forward with a huge smile and begins telling me about his team. Isaac, formerly of Pok Pok in New York City, and Candice, a chef with a modernist approach, are his teammates in this battle of secret local ingredients. He purposely chose two people whose approaches are different from his. They all have an ability to think “out of the box” and get creative with local ingredients, so he is confident they can win. The adrenaline and stress of cooking is something he enjoys and will be an asset during the competition. Because Chef Adams enjoys the spontaneity of creating menus with ingredients that might have to change without much notice, he will be a worth adversary. The weather, growing conditions, pests, and other unexpected obstacles can throw the proverbial curve ball into a menu based on local, seasonal produce. Chef Adams has dealt with this circumstance before which will likely help him in a chef’s competition based on North Carolina ingredients revealed moments before the cooking begins. If you have not been to one of the Got to Be NC Competition Dining Series events, you are missing out. It is not only delicious and fun, but as a ticket holder, you get to vote on each course. So, check out their schedule and get your ticket today. The Triangle portion of this statewide competition should prove to be quite amazing with chefs like Ben Adams in the line up. A huge THANK YOU to Chef Ben Adams for taking time to sit down and talk with me. I look forward to my next visit to Piedmont, and I will be cheering for him on January 27th!